Welcome to a new year of Meezer Musings! Wishing you a happy 2015 with the Siamese cats in your lives. An especially warm welcome to you if you've joined us recently; I hope you'll enjoy browsing through the site and that you find answers to your questions here - if not, do let me know. This month we're taking a look at missing cats. Over the past year several of our readers, either of this website or our associated Facebook page, have had to cope with cats who've escaped or gone missing, so I felt it would be helpful to put together a list of some of the things you can and should do if this ever happens to you. But first I'm going to tell you a story, because this newsletter was also sparked by the disappearance and search for one particular cat. Their faces are similar to Lynx Point Siamese, but the body markings are quite different. 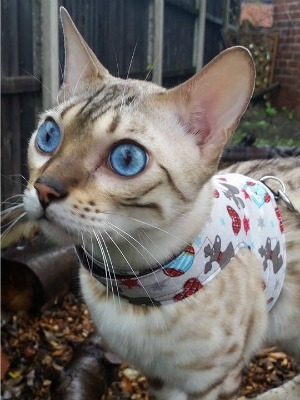 You may remember that last June's newsletter was all about cat safety and in it I mentioned the harnesses made by Butterfly Cat Jackets, the owners of which have three Bengal cats, which are as active (or more so!) than Siamese cats. Devastatingly, Jimmy, the largest of the three cats, managed to escape through a momentarily opened door just before Christmas, on the 19th December. Jimmy vanished into the cold and dark of an English winter's night. His owners immediately went to look for him in their garden and spotted him once, but he ran away and despite several hours of searching they didn't see him again. This sometimes happens when cats first escape, as they'll treat things as a game and play 'hide and seek' with their owners. Jimmy didn't return that night, nor the next or the next. His owners scoured the surrounding areas by day and by night, knocked on doors and checked gardens, churchyards and waste ground, but although some local children reported a possible sighting, there was no sign of Jimmy anywhere. His owners left trails of food (hungry cats are often attracted by strong-smelling food like sardines, tuna, ham or cheese) and set a trap which managed to catch several other local cats, but Jimmy was not among them. An extremely sad Christmas came and went. On December 28th Jimmy's owners contacted Animal Search UK, which has a free missing pet listing service. They also have a professional search team, for which there's a (fairly high) fee. Jimmy's owners had high hopes of booking a professional search, but found that they couldn't quite afford one. The hunt for Jimmy attracted a large, anxious following on the Butterfly Cat Jackets Facebook page. Several followers wanted to make donations (by this time I think everyone would happily have contributed to get Jimmy home) and despite initial reservations, a donations page was set up. Donations came in quickly overnight and by morning there was enough in the fund to pay the fee. So the search was on! Animal Search UK claim to have an 80% success rate in finding lost pets. Their search team is highly trained, saturating a wide area with leaflets and posters, conducting house-to-house inquiries and searching gardens and open ground. The high visibility provided by this type of search will often reveal a lost pet's whereabouts immediately, but if not, the animal may surface a few days later due to the increased awareness in the area. On December 30th, eleven days after Jimmy first went missing, the search team arrived. Having followed the hunt for Jimmy from the beginning, I must admit to having wondered whether the search team would actually be successful, after the unceasing efforts by his owners hadn't been able to trace him. But find him they did! The team arrived at 11:15 a.m. and by 2:45 p.m. Jimmy was safely home. Very thin, very hungry, but alive. 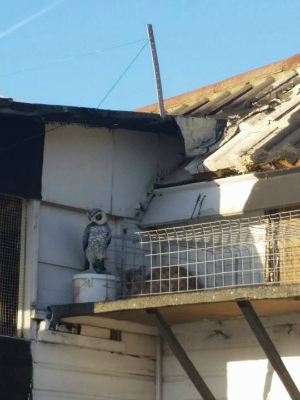 He was found by one of the search team sheltering on a ledge, only 180 yards (as the crow flies) from his home. In a strange (and now amusing) twist, someone had seen Jimmy following a pig into a nearby field. His sense of direction must have become confused as despite not being all that far from home he had been unable to find his way back. Jimmy was checked over by a vet and despite being very thin had no major health issues. He's now back at home again, gaining weight and recovering from his outdoor ordeal, and back to his former beautiful self. The ledge where Jimmy was found. You can see him sheltering in the corner. If you can't find your cat but aren't sure that it's outside, the first thing to do is to check every inch inside your home. Search all rooms, cupboards and closets, under and behind furniture and any other areas to which cats like to gravitate - washing machines, tumble driers and other warm spots and cubby holes. 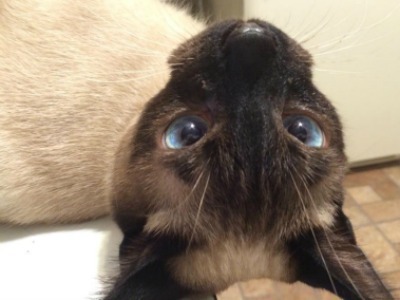 This is important as cats can squeeze into the tiniest spaces, as you'll find out if you read the full story of Houdini, our Meezer of the Month below. Check every inch of your own outside space, and then the local area. Garages, garden sheds, summerhouses, any other outbuildings. Look under shrubs and bushes, tarpaulins, garbage cans, parked cars, wheel arches. Search at dawn and dusk when cats are likely to hunt for food, and go out after dark as well. Flashlights can often reveal a cat's location by picking up the gleam of their eyes.Take some dry food with you, call your cat by name, and take the time to listen out for any cries in reply. Create 'missing cat' flyers and posters. Include a photo of your cat, some (but not all) identifying details, the date, time and location your cat was last seen, and your telephone number. Don't include every detail though - keeping one or two identifying details back will allow you to check that someone has actually found your cat if they phone you. Distribute flyers to every household, and put posters up all around the area unless there's a local restriction on doing so. Use string to tie posters to fences and trees - don't nail them as you can be fined for doing this. Alert the neighbors. Contact the residents of as many houses as you can around you in your own street, any properties that back on to yours, and surrounding streets, and ask them to check their own gardens, yards and houses. Leave flyers if there's no-one around, but make a note to go back again and actually speak to people if you can. They may not always read notes that you put through doors. Entice your cat back with familiar smells. If you have a garden, yard or other outside space, put your cat's bedding, one or two toys, and a piece of your clothing (all unwashed) outside but under cover so that it's sheltered from the rain. Other items with familiar smells might be litter boxes or the contents of your vacuum cleaner. All of these can help in guiding your cat home. Get on the phone. Make phone calls to all local veterinary practices as well as nearby animal pounds, shelters, or rescue centers. If your cat is microchipped, call the relevant microchip company. You could also try telephoning your local environmental health, street-cleaning or garbage collection company to ask whether they have picked up any dead cats. They may have news you don't wish to hear, but at least you'll then know what's happened. Above all, don't despair. It's quite normal to fear the worst, but cats are resourceful and adaptable creatures - very often more so than we give them credit for - and have been known to go missing for weeks and even months and eventually return, either of their own accord or through continuing search efforts. The more you can do to search, and find out what has happened to your pet, the better. Actively doing something will also help keep the fear at bay. January's Meezer of the Month is Houdini, suitably named for this month's topic of missing cats! Houdini was kept in a cage for the first seven months of his life until he was adopted by Elsa. 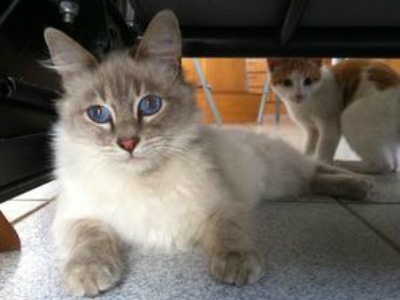 He was very frightened and shy, and would hide away to begin with, but Elsa worked hard to settle and calm him down. You can read his full story here and find out how he got his name. Isn't he gorgeous? Coincidentally (or perhaps not?) a friend of mine recommended this book to me not so long ago. Find out more about it all here! Lost Cat: A True Story of Love, Desperation, and GPS Technology is another story about the search for a missing cat. When Tibia, the much-loved cat of author Caroline Paul and illustrator Wendy MacNaughton, disappeared they were at first distraught and then when he returned weeks later, overjoyed. But where had he been? Caroline and Wendy used GPS technology, cat cameras, psychics, the web, and animal communicators to find out what Tibia did when they weren't around. This month's fun photo from our Facebook page is of Kim Hammad's MuShu, taking a topsy-turvy view of the world! Wishing you and the cats in your lives a safe and happy February. We'll be back again at the end of next month with a very different theme, as we're going to take a look at what you can do to keep your cats amused inside your house.